Bones are rigid organs that support and protect various organs of the body, produce red and white blood cells and store minerals. Osseous tissue (sometimes referred to as bone tissue) gives bone its rigidity and coral-like internal three-dimensional structure. Other types of tissue found in bones include bone marrow, endosteum, periosteum, nerves, blood vessels and cartilage. When a child is born he or she has over 270 bones in the body. Many of these fuse together as the infant grows and an adult human has 206 bones in the body. The largest bone in the human body is the femur in the leg, and the smallest is the stapes, a small bone found in the inner ear. 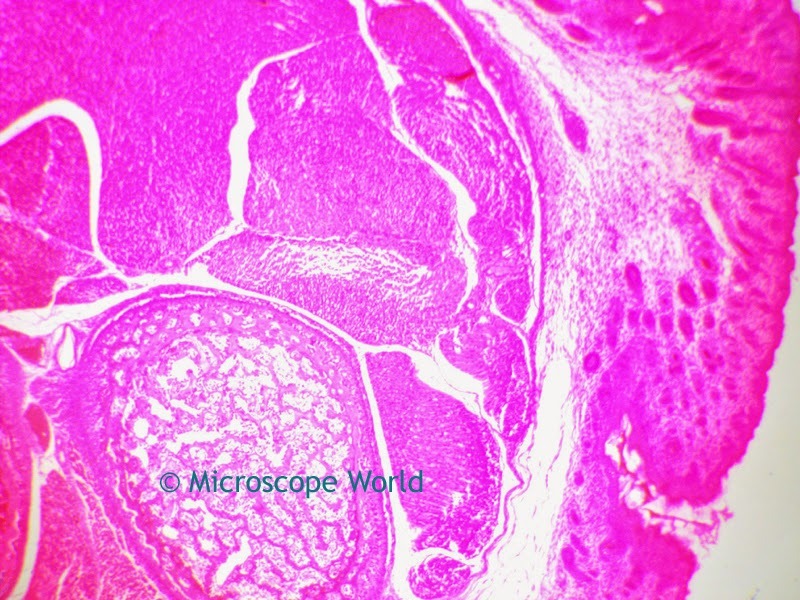 Bone and cartilage captured under the microscope at 40x magnification. Cartilage is a flexible connective tissue that is not as hard as bone, but is stiffer and less flexible than muscle. Cartilage is found in the joints between bones, the rib cage, and even in the ear and nose. Unlike other connective tissue, cartilage does not contain blood vessels. Bone and cartilage captured at 100x under a biological microscope. 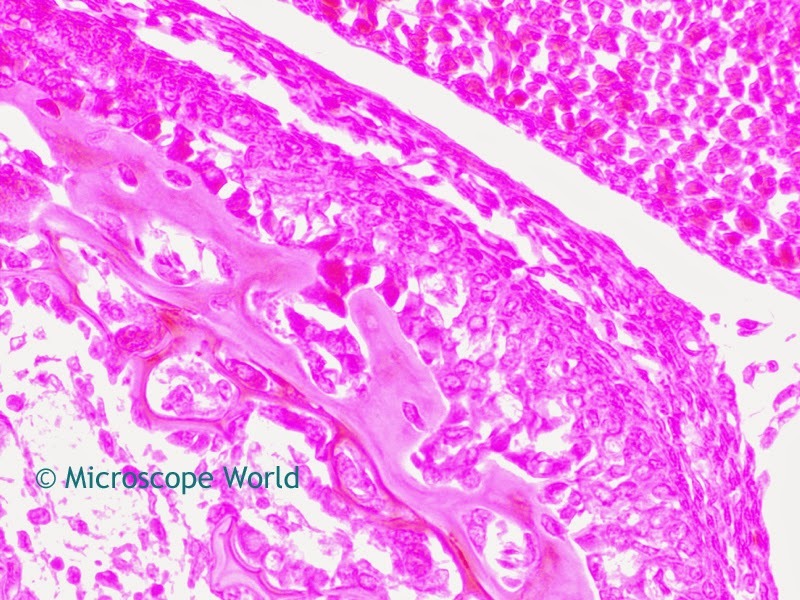 Bone and cartilage prepared microscope slide can be purchased as part of the Histology Prepared Slide Kit. Images of bone and cartilage were captured with the Richter Optica U2 biological microscope using a microscope digital camera. 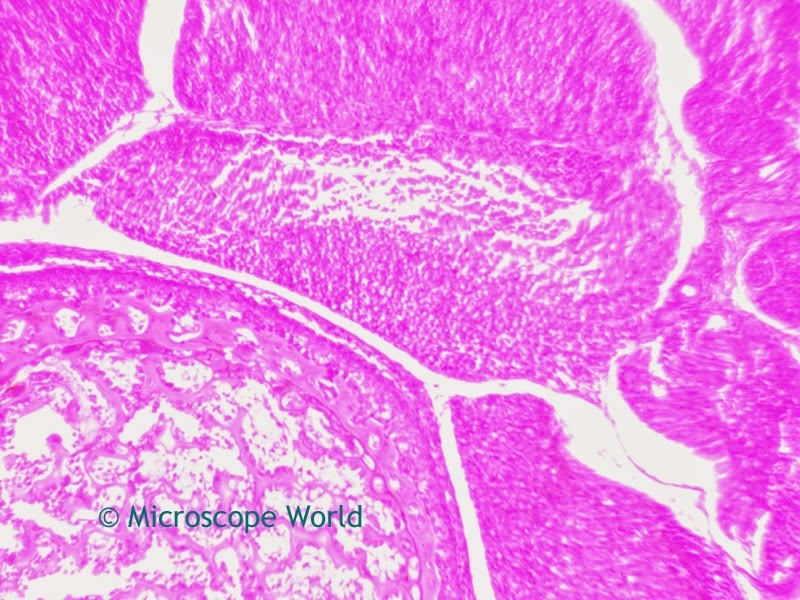 Bone and cartilage captured at 400x magnification under a biology microscope.